The brainchild of Ted Warmbold and Marcia Lucas, Austin Friends of Folk Art began in 1987 as a small but enthusiastic band of culturally curious explorers. 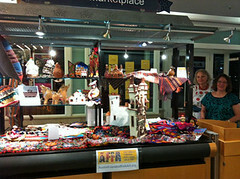 passionate lover of folk art and owner of El Interior, a store featuring folk art of Mexico. The two were drawn together by efforts to find a permanent home for the wonderful folk art collections of Nelson Rockefeller and Robert K. Winn. fortune-telling, Oaxacan wood carving and Byzantine icon painting. about the organization and their dreams for it. Teresa Kendrick (President 1990): “We managed to have fun at this learning endeavor. community of friends; and 3) making Austin Friends of Folk Art financially viable. Merry Wheaton (2007-2013): “AFFA has matured structurally over the last several years. media. These efforts led to three exhibits that put folk art in the public eye. Be an AFFA Angel! Suggested donation levels are $10, $25, $50, $100, $250.